These insights came at the National Civil Rights Museum in the Lorraine Motel where the Rev. Dr. Martin Luther King Jr. was assassinated 50 years ago Wednesday night. Church bells started ringing here 39 times and continued from Anchorage, Alaska, to Jacksonville, Fla., and in the Vatican, Germany and India to represent each year of King’s life. His legacy is amplified by new museum exhibits where Bernice King and Eric Holder spoke on Monday before those exhibits opened. “He taught us the importance of … nonviolence; not only as a tactic, but as a way of life,” Bernice King said. “So here we are with all of the challenges that we are faced with; we have in this polarized, divisive climate, not just in this nation, but all across the world … [and] … the focus is around the legacy of Martin Luther King Jr.
Bernice King noted students’ reaction to school shootings and she advocates a new program starting in Atlanta, MLK 50 Forward, a way to activate people. “These are revolutionary times as we speak,” she said. In a separate appearance Monday afternoon, one of President Obama’s attorney generals recognized an exhibit including Riverside Church where King “really starts alienating” people; taking the movement internationally and against the Vietnam war. 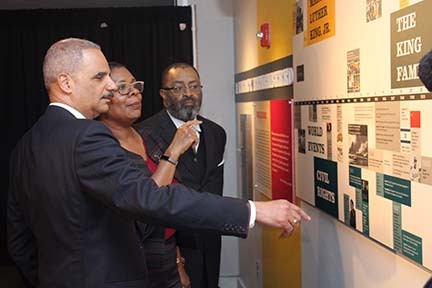 Holder toured the museum to “immerse myself in the legacy of a great man,” he said, recognizing the museum speaks of several Civil Rights leaders. “We are in the presence of, what I call, a small group … the second founding fathers. These men and women remade the nation,” Holder said. “They helped evolve and change it and it is fundamentally different from the nation before the Civil Rights movement. The nation is better and a system of American apartheid was brought down by them. The nation was made more fair, more just, more equal. “That’s why … I call him … one of the second founding fathers,” Holder said of King. Bernice King said it was “especially meaningful” for her to be at the Lorraine Motel this week because she couldn’t be with her parents when they were here 50 years ago. 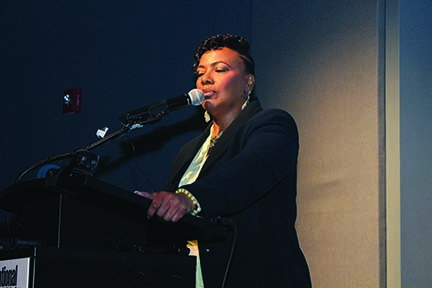 Looking forward with hope, Bernice King noted changing times. “I think we are in that season now where we’re going to have to learn to live together because there’s no way in the world that any of us will think alike,” she said, noting there has to be nonviolent coexistence or violent co- annihilation.